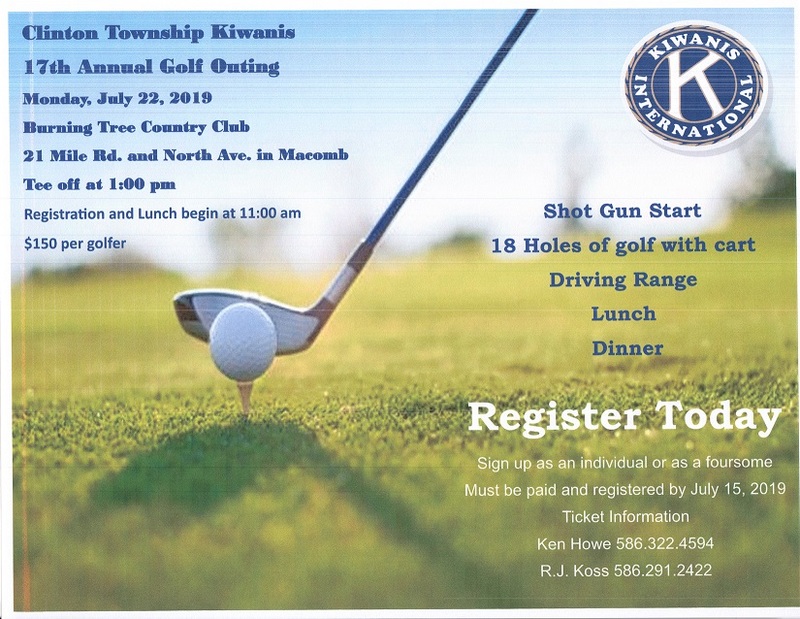 The Clinton Township Kiwanis Club will hold its 17th Annual Golf Outing Monday July 22, 2019 at Burning Tree Country Club, 21 Mile and North Avenue in Macomb Twp. Tee off @ 1:00 PM. Celebrating 28 years of "CHARITABLE COMMUNITY SERVICE" made possible by the support of many businesses and individuals in Clinton Township, Macomb County and beyond the Clinton Township Kiwanis is hosting its 28th Annual Wild Game Dinner. Delicious food, raffles, and live auctions make the evening a special night. Early Bird Appetizers & Soups 6:00 PM - 7:30 PM, Dinner Buffet 8:00 PM. Join us at the Fern Hill Country Club 17600 Clinton River Road, Clinton Twp. MI. For ticket information call or email Ken Howe 586-322-4594 - kenage96@aol.com. Santa and his elves (Dakota High School, International Academy of Macomb and Chippewa Valley Key Club Students) make the Holidays a Little Brighter for Clinton Township and Macomb County children recommended by social services and other agencies. Each child has his/her picture taken with Santa and receives a Christmas Present from Santa and his elves. Lunch is served and Key Club Members play games with the children, danced to music played by a DJ, do crafts, and face painting. Bring your cameras to capture the fun. In a joint partnership with the Chippewa Valley School District, the L'Anse Creuse School School District and local businesses Clinton Township Kiwanis collects non-perishable foods for its annual Thanksgiving Community Food Drive. Food donations are collected from schools in the 2 districts, stored in a donated local warehouse, packaged in boxes (supplied by a local business) and distributed to over 500 families. Email Clinton Township Kiwanis (clintontkiwanis@gmail.com)if you can help or need our help. All Deliveries will be done on Saturday November 17 2018. Tax deductible donations payable to the Clinton Township Kiwanis Foundation to support this event are always welcomed. Continuing a popular tradition the Clinton Township Kiwanis Club will again be selling a premium quality Gourmet Nut Mix and a “Delicious Delights” Candy Mix. There are several locations that will have nuts and candy for sale. Contact chairperson Rick Moeller @ 586-246-7440 or visit a location near you. Call Rick if you would like to be added to this list. The Clinton Township Kiwanis Club will hold its 16th Annual Golf Outing Monday July 23, 2018 at Burning Tree Country Club, 21 Mile and North Avenue in Macomb Twp. Tee off @ 1:00 PM. The Clinton Township Kiwanis Club will hold its annual Golf Outing Monday July 13, 2015 at Burning Tree Country Club, 21 Mile and North Avenue in Macomb Twp. Tee off @ 1:00 PM.